Figure 1: The Sochi 2014 Winter Olympic Games stadium was designed and constructed by architecture firm Populous, inspired by a Faberge egg. The stadium was constructed from translucent polycarbonate to allow light projections during the games. Figure 2: St Basil's Cathedral, also known as the Cathedral of Vasily the Blessed and officially called the Cathedral of the Intercession of the Blessed Virgin on the Moat, is located in the Red Square, Moscow. It was constructed by Ivan the Terrible in 1551 - 1561 to commemorate the capture of Kazan and Astrakhan. Figure 3: GDP growth rate (blue line), GDP/capita (green line), unemployment rate (purple line), gypsum production (pink line), in Russia from 1993 to 2011. Sources: IMF World Economic Outlook Database October 2013, Infomine Market Research, USGS Mineral Yearbooks. Figure 5: Gypsum wallboard plants in Russia. Source: Global Gypsum Directory 2013 and research performed for the Global Gypsum Directory 2014. Figure 7: In January 2014 Gyproc supplied fire-resistant building elements for the construction of Moscow's 'Italian Quarter,' situated on Dolgorukovskoj, 2km from the Kremlin. Figure 8: The Gipsopolimer quarry in Dobryansky, Perm, has been mined since 1980 by the open method. The Chumkasskogo gypsum deposit borders the Kama Reservoir. Figure 9: Askolit's high quality gypsum mine in Kazan, Tatarstan has more than 90% useful components and is home to the Fonika Gips gypsum wallboard plant. Figure 10: Askolit's Gazoporshnevoj power plant provides all of the required energy for production processes at the gypsum plant in Tatarstan. Figure 11: The Moscow Kremlin, the most well-known Russian citadel, comprises five palaces, four cathedrals, the Kremlin Wall and the Kremlin towers. The Kremlin is the official residence of the Russian president. The fortress was built in 1482 - 1495 and is among Russia's UNESCO World Heritage Sites. In 2013 gypsum wallboard producer Knauf provided financial assistance for the reconstruction of some of the Kremlin Museum areas. Figure 12: The 2013 'Championship of Russia' road ice race was sponsored by Forman, a subsidiary of Samara Plaster. Source: http://forman-sgk.ru/gallery/racing.php. The Russian Federation, established in 1991 following the downfall of the Soviet Union, is a semi-federal republic located in the north of Eurasia. The government rules 83 federal subjects comprising 47 oblasts, 21 republics, nine krais, four okrugs and two federal cities, from its base at the Kremlin in Moscow, Russia's capital city. As the largest country in the world, Russia spans 17,075,400km2 and had 143m inhabitants in 2012,1 making it the world's 10th most populous nation. The Russian gypsum industry has seen its fair share of market fluctuation thanks to multiple industrial and economic events that have overtly affected the construction industry. Here we give an overview of the industry as it stands today and its potential for the foreseeable future. Russia is bordered by many nations that include Norway, Estonia, Finland, Poland, Latvia, Lithuania, Belarus, Ukraine, Georgia, Azerbaijan, Kazakhstan, China, Mongolia, and North Korea. The European nation is the world's largest oil producer and holds the world's largest natural gas reserves.1 With 23 UNESCO World Heritage Sites, 40 UNESCO biosphere reserves, 101 nature reserves and 41 national parks, Russia has a highly variable topography that includes mountains, tundra, forest, grasslands and semi-desert. The modern Russian nation was founded in the 13th Century and ruled by the Mongols. In the early years, Russia was hit by plagues, invasions and the Little Ice Age between 1350 - 1850. Assisted by the already strong Russian Orthodox Church, the Mongols were overthrown in the Battle of Kulikovo in 1380. In 1547, Ivan IV, 'the Terrible,' was crowned as Russia's first Tsar. The country was ruled by successive Tsars until 1721, when it was proclaimed an Empire. Industrialisation began in 1861 and times were prosperous until the Russian Revolution, which was triggered by the failed Russo-Japanese War in 1905. To regain control, the government legalised political parties and allowed freedom of speech, which prompted the formation of the Communist Party. Russia joined World War I in 1914 in response to Austria-Hungary's invasion of Serbia, which was followed in 1917 by the February Revolution. This was prompted by rumours of corruption and treason of Nicholas II, who was the last Emperor of Russia. The Union of Soviet Socialist Republics (USSR) was formed in 1922, while in 1941 the nation joined World War II after Germany invaded. The War ended in 1945 when the allies captured Berlin. Russia then became the world's second nuclear weapon power, struggling against the USA and NATO for global dominance in the Cold War. The demise of the Soviet Union came in 1991 and Boris Yeltsin, Russia's first president, was elected to rule the new Russian Federation. The following era was highly unstable, blighted by the Ruble crisis that began in 1998, which saw many plunged into extreme poverty by currency devaluation. Despite financial assistance provided by the International Monetary Fund (IMF) and the World Bank, the financial disaster ended only when Russia defaulted on its debt. In 1999, Yeltsin resigned and was replaced by the recently appointed prime minister, Vladimir Putin, who went on to win the 2000 presidential election and who was also re-elected as president in 2012. The Russian government has attempted to reduce the country's reliance on commodity exports and instead promote growth in its technology sectors. Few results have yet been achieved, which resulted in the economy being badly hit by the global financial crisis in 2008 when oil prices plummeted. As for other BRIC economy countries, a large proportion of the labour force works in industry (27.4%). Agriculture employs 7% of the labour force and 27.4% work in the service sectors. Population growth was recorded at -0.2% in 2013, with a birth rate of 12.11/1000 and a death rate of 13.97/1000. Immigration was at 1.69/1000 in the same period, preventing the Russian population from going into decline. Gypsum mining fell in the 1990s due to the Ruble crisis, which caused a major depression of the construction industry (Figure 3, pink line).9 Production levels of raw gypsum reached their lowest at 559,000t in 1997 and peaked at 3.6Mt in 2008. Having dropped slightly since the global financial crisis, levels of gypsum production hit 3.0Mt in 2011, the latest year for which accurate data is available. Turkey's Erişim Makina is a major supplier of gypsum plant equipment in Russia.10 The company has provided complete turnkey gypsum plants to Askolit and Volma, in addition to a wide variety of gypsum plant equipment to Gypsopolimer and Knauf. Erişim Makina opened an office in Moscow in December 2012 in order to better coordinate sales and customer relationship management in Russia, Ukraine and the CIS. In an accompanying statement, Erişim Makina announced that by establishing a presence in Russia it aims to target companies and investors 'at home' and in their native language. The Russian gypsum industry is inarguably dominated by Knauf, which has a total Russian wallboard production capacity of 320Mm2/yr from its seven plants.11 In 2010 the company produced 59% of Russia's total gypsum product output.12 In the same reporting period Volma produced 14%, Samara Plaster produced 3% and Gipsopolimer produced 2%. Knauf entered the Russian market in 1993 with the purchase of a small stake of the Tigi plant in Krasnogorsk. Since then, the company has expanded massively across the country, increasing capacity by acquisitions, building new plants and installing the latest technologies at its plants to further increase production capacity. Knauf currently operates from 22 sites across Russia, at which it produces wallboard, dry mixes, cement products and metal fixings. Volma Corporation was established in 1943 with the construction of its first plant in Volgograd, which began manufacture of gypsum dry mix in 1949 and gypsum wallboard in 1953. The company is the second largest gypsum manufacturer in Russia by installed capacity, with a total wallboard production capacity of 54Mm2/yr from its plants in Volgograd and Voskresensk.13 Volma also owns an additional plant in Volgograd, one plant in Chelyabinsk, two plants in Tatarstan, a gypsum quarry in Orenburg and a second gypsum quarry in Ryazan. One additional plant, at the gypsum quarry in Orenburg, is due for commissioning at the end of 2014 and will create up to 1000 jobs. A range of products that excludes wallboard but includes gypsum dry mixes and tiles is produced at these sites. In October 2013 Volma signed an agreement with the Head of the Adygei Republic in the sphere of investment activity to begin work on the company's seventh Russian gypsum plant. The Maykop plant will be situated in the Republic of Adygea and is projected to cost Euro21.2m. Saint Gobain's Gyproc owns a 30Mm2/yr capacity gypsum wallboard plant in Gomzovo, Nizhny Novgorod district.14 The Gomzovo plant was constructed at a cost of Euro70m, provides employment to 87 staff and is based at its own gypsum quarry. Pierre-André de Chalendar, chairman and CEO of Saint-Gobain, officially commissioned the plant in July 2013. "The start-up of this new plant is an important step in the group's development within the Russian habitat and construction markets," said de Chalendar. "With its unique portfolio of products and solutions, Saint Gobain serves rapidly-growing construction markets worldwide. Russia's climate, its rising purchasing power and pressing need for housing means that it is a country with great potential for the group." On 15 November 2013, Saint Gobain opened its first innovative training centre, the 'Academy of Saint Gobain' in Moscow. From the site, the company will develop innovative construction methods using materials developed by its subsidiaries, including Gyproc, Isover, Isotec, Weber-Vetonit and Ecophon. In January 2014, Gyproc supplied building materials for the construction of Moscow's own 'Italian Quarter,' a new luxury apartment sector in the heart of the city. Supplies included fire-resistant wallboard and Gyproc-Ultra, a steel building element required for the installation of gypsum wallboard. Gipsopolimer was established in April 1953 in the Perm region of Russia to supply the government with construction materials. The company was privatised in 1993 and the plant was modernised in the following years and today has a gypsum wallboard production capacity of 10.8Mm2/yr and a dry mix capacity of 260,000t/yr.15 Gipsopolimer also operates three gypsum quarries that are located in Chumkasskoe in Dobryansky region, Razepinskoe in Kungur region and Chuviryata in the Kungurskiy district. Gipsopolimer uses a unique production method that was perfected in 1980 to manufacture high-strength gypsum wallboard that has not been duplicated elsewhere in the world. The gypsum is autoclaved with steam at high pressure and temperature to produce a wallboard and plaster material that is twice as strong as traditional gypsum wallboard. It is sold as 'Universal' and screed 'ECOPOL.' Gipsopolimer products are sold by sister company Kama Gypsum Company, established in 1998. Askolit's industrial complex in Kazan, Tatarstan, is the newest entrant to the Russian gypsum industry, having been commissioned in June 2013. The complex comprises a high quality gypsum mine, in-house power stations, research laboratories and the Fonika Gips plant, which has multiple production lines.16 Line 1, commissioned in June 2013, is a gypsum wallboard line with a production capacity of 15Mm2/yr. Line 2, a 300,000m2/yr capacity tongue-and-groove board line, was commissioned in October 2013. The complex also has a 120,000t/yr production capacity of gypsum dry mix, as well as producing a wide range of speciality board products that include water and fire-resistant plaster boards and hollow and full-bodied plaster and gypsum boards. In November 2012 Mordovcement, under the name 'LLC Magma,' announced its intention to commission an industrial complex in Mordovia, comprising a 30Mm2/yr capacity gypsum wallboard line, a 560,000m2/yr partition block line, a 100,000t/yr gypsum construction block line and a gypsum binder line with a capacity of 90,000t/yr, by the end of 2012.17 The complex was constructed as planned and was fitted with equipment from Germany's Grenzebach. Head of the Republic of Mordovia, Vladimir Volkov, praised the launch, saying, "It is without any exaggeration to say that this is a world-class production." Although no announcement was made regarding its commissioning, in the first half of 2013 results, Mordovcement stated that it had sold 5.4Mm2 of gypsum wallboard, 36t of dry construction mixtures and 3t of gypsum binders. Mordovcement, via its subsidiary Gipor-M, mines raw gypsum from its 1Mt/yr capacity quarry in Poretsky, Chuvash Republic. Privately-owned GIFAS is Russia's smallest wallboard manufacturer with a production capacity of 5.4Mm2/yr at its Sverdlovsk plant in the Urals district.18 The company also produces 120,000t/yr of dry mixes, including gypsum, concrete and plaster mixes, in addition to 140,000m2/yr of landscaping tiles. GIFAS states that its primary markets are the Ural Mountains and Western Siberia. July 2013 saw Azerbaijani building materials producer Matanat-A re-register land in the Uspensk district of Krasnodar, intended for an industrial complex of five plants, including a gypsum wallboard plant.19 Company president, Elkhan Bashirov, said that negotiations with the district administration about the start of construction are on-going. "The point is that the purchased land is registered as agricultural land," he said. "In this respect we submitted the documents for re-registration of land for industrial work." The agreement to build the complex was originally signed on 16 September 2011 at the Jubilee X Investment Forum in Sochi. The plant build will be funded by a Euro30m investment, of which 30% will come from Matanat-A and the remaining 70% from a loan. The company also purchased a gypsum quarry in the Otradnensky district. Samara Plaster's Strommashina plant was established in 1942 to supply the mining, construction and metallurgy industries with building materials and equipment.20 The company's key product range today is industrial plant equipment, gypsum ready mix and gypsum cam boards. The plant does not produce gypsum wallboard, but in October 2013 a new 415,000m2/yr capacity gypsum partition block line was commissioned. Installation was performed by Germany's Grenzebach,21 while the products of the first six months of production were ordered prior to the line commissioning. Askolit utilises an in-house power plant in its industrial complex in Tatarstan, which produces environmentally-friendly and self-sufficient energy. In December 2013 a review of the complex was completed by the Centre for Hygiene and Epidemiology. The risk to local residents was determined to be minimal, with pollutant concentrations of <0.03 Maximum Allowable Concentration (MAC) in the 500m radius of the site and 0.01 MAC in the residential area, rendering further pollution control measures unnecessary. Russian wallboard producers are strongly involved with social responsibility initiatives. Knauf, Volma and Gyproc all sponsor local charitable events, supply materials for the restoration and construction of educational and healthcare facilities, as well as providing excellent services and opportunities to its employees, with particular focus on family values. One of Knauf's main contributions is its involvement with historic buildings; the company provided financial assistance for the reconstruction of the Moscow Kremlin Museums, in addition to providing tools and building materials for the restoration of many Russian Orthodox Church parishes. Volma promotes healthy living among its employees by arranging regular sporting events. In January 2014 Alexander Malashkin, president of Volma, carried the Sochi 2014 Winter Olympic Flame for part of its journey: "I want to share what I feel with all supporters of Russia and with all of the people of our country," he said. "I feel I am in one powerful chain of a huge country, one of thousands of people who have carried the flame. I want to inspire everyone in advance of the main sporting world event of 2014." Askolit provides three meals a day to its 450 employees in Tatarstan, employs on-site healthcare professionals and provides housing for employees who are new to the area. The company also sponsors local events, including the 9th 'All-Russia competition of young geologists,' in August 2013. Samara Plaster is involved in similar local events, supplying the 'Affordable and Comfortable Housing and Utility Services to Russian citizens' government-run scheme with plastering equipment via its subsidiary, Forman, starting in 2012. The scheme is intended to aid the economy by reducing housing mortgage interest rates and increasing the annual volume of loans to 868,000 loans in 2020. Specific categories of buyers, including young families and public sector employees, are intended to benefit from the affordable residential housing market. Samara Plaster, again by its subsidiary Forman, also sponsored the 'Championship of Russia' road ice racing in February 2013, held at the Samara Ring ice track. Belgips plant, increasing its production capacity to 10Mm2/yr, in addition to constructing and commissioning a new gypsum wallboard plant in the village of Gatovo, Minsk district, by 1 July 2018. The plant will manufacture up to 500,000m2/yr of gypsum partition blocks, 100,000t/yr of dry mixes and 30Mm2/yr of gypsum wallboard. Germany's Knauf also announced an interest in purchasing Belgips in October 2013, but ultimately lost out to Volma. In August 2012 wallboard producer USG announced that it had entered into a definitive agreement for the sale of its European business operations to affiliates of Knauf for Euro59.2m. The businesses included the manufacture and distribution of Donn® brand ceiling grid and Sheetrock® brand finishing compounds throughout Russia and Turkey. The deal was completed in December 2012,24 increasing Knauf's dominance in the Russian gypsum industry even further. "While USG's European operations have been performing well, we prefer to focus our investment in higher growth markets," said James S Metcalf, chairman, president and CEO. The IMF predicts that growth in the Russian economy will slow in the coming years due to inadequate infrastructure, over-reliance on commodities such as oil and natural gas and a weak business climate.1 It predicts GDP growth rate will reach 3.0% in 2014, compared with predicted values of 1.0% for Europe and 3.4% for CIS. While a growth rate of 3.0% seems impressive in terms of the current global financial situation, where recovery from the global financial crisis is still evident, it is unexepectedly low when compared with other BRIC economies. Additionally, the IMF foresees other long-term challenges faced by Russia, which include a shrinking workforce, corruption and poor infrastructure. Roskill predicts that the global gypsum industry will grow by 5%/yr until 2018 due to the increasing popularity of the construction material, combined with the fact that many countries will have finally escaped the effects of the global financial crisis.7 It also adds that future trends will include an increase in flue gas desulphurisation (FGD) gypsum. In spite of mixed predictions regarding the future of the Russian gypsum industry, the Russian producers have continued to increase production capacity by expansions and new plant constructions. Gipsopolimer has announced its intention to construct a fully automated 90Mm2/yr capacity gypsum wallboard production line that is due for commissioning in 2016.22 Similarly, Askolit plans to possess 5% of the gypsum industry market by 2018 by sequential capacity increases. Gyproc has plans to commission up to three new wallboard plants and two gypsum ready mix plants in the near future, while Volma is currently developing two new gypsum plants. Given the level of production capacity increases in recent years and the planned and partially-constructed new gypsum wallboard plants that are due for commissioning within the next five years, it seems reasonable to conclude that Russian gypsum producers consider the future of the domestic gypsum industry a safe bet. 1. IMF World Economic Outlook Database October 2013. 2. Sheehy, N., Chapman, A. J., Conroy, W. A., "Ivan Petrovich Pavlov," Biographical Dictionary of Psychology, page 18, 2002. 4. The World Bank, http://data.worldbank.org/country/russian-federation. 7. Roskill, "Gypsum and Anhydrite: Global Industry Markets and Outlook, 11th edition," 2014. 8. "The world's largest underwater gypsum cave in Russia," http://whenonearth.net/worlds-largest-underwater-gypsum-cave-russia/. 12. Gipsopolimer's Annual Report, http://www.gipsopolimer.ru/raskr/buh/30/, 2011. 19. 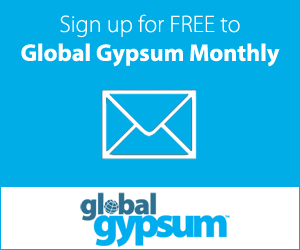 Global Gypsum News, http://www.globalgypsum.com/news.